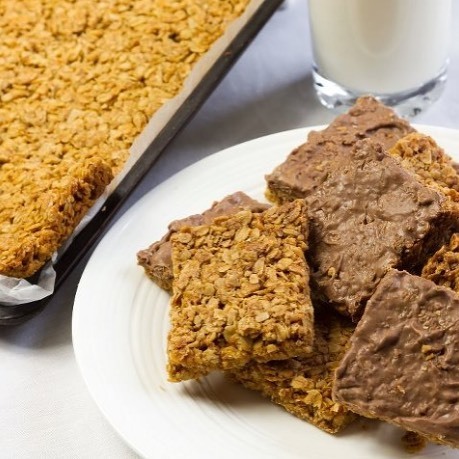 Mary Flahavan’s Oaty Flapjacks with chocolate on top! This is a wheat free recipe. Melt margarine or butter in a saucepan with the sugar and golden syrup. Heat gently until the sugar is dissolved. Tip the mixture into a swiss roll tin (22cm x 33cm, 9’’ x 13’’) lined with parchment and press it out evenly using the back of a spoon. Bake in preheated oven for approximately 30 minutes or until golden brown. When baked, coat with melted chocolate as a special treat. Cut into squares while still warm and leave to cool in the tin. These nutritious flapjacks keep very well in a tin. Children love their crunchy texture and they make an ideal addition to any lunchbox. Previous PostPrevious Ease your way into the weekend with a lazy breakfast..
Next PostNext New Goats Cheese on the menu this evening! Boile Goats Cheese with Textures of Organic Beetroot for our in house garden!